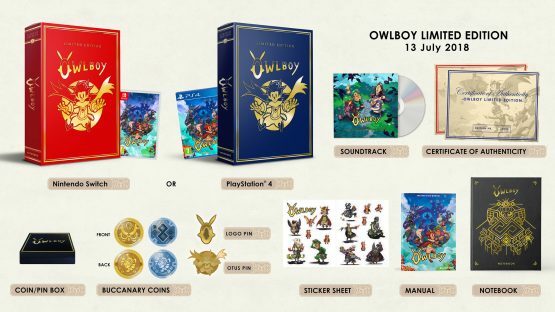 SOEDESCO has announced today that they will be releasing a very special Limited Edition of Owlboy for Nintendo Switch and PlayStation 4 later this summer. The Limited Edition will not only collect the base game but will also come with a ton of goodies that fans of the game will no doubt want to add to their collection. Owlboy tells the touching story of owl misfit Otus, a feathery little fellow struggling to live the owl life. Fate strikes when Otus’ beautiful homeland is invaded by a horde of malicious sky pirates. Otus embarks on a fascinating journey through seemingly endless skies and mysterious, monster infested ruins. He must recruit his friends to employ their special puzzling- and combat skills, fight his foes and fly his way to safety. Heartfelt, intriguing story about the adventurous journey of an underdog owl. Detailed, colorful and beautifully vibrant pixel art style. Tremendous variety in surroundings and enemies. Explore massive dungeons and face epic boss battles.